One of the basic tenets of capitalism is that everything has its price. This is not the same as saying that everything is for sale. Love, for example, can be rented, but most attempts to buy it outright are tragic. Or pathetic. But apparently you can buy a month. An entire month. And the cost isn’t all that high, either. 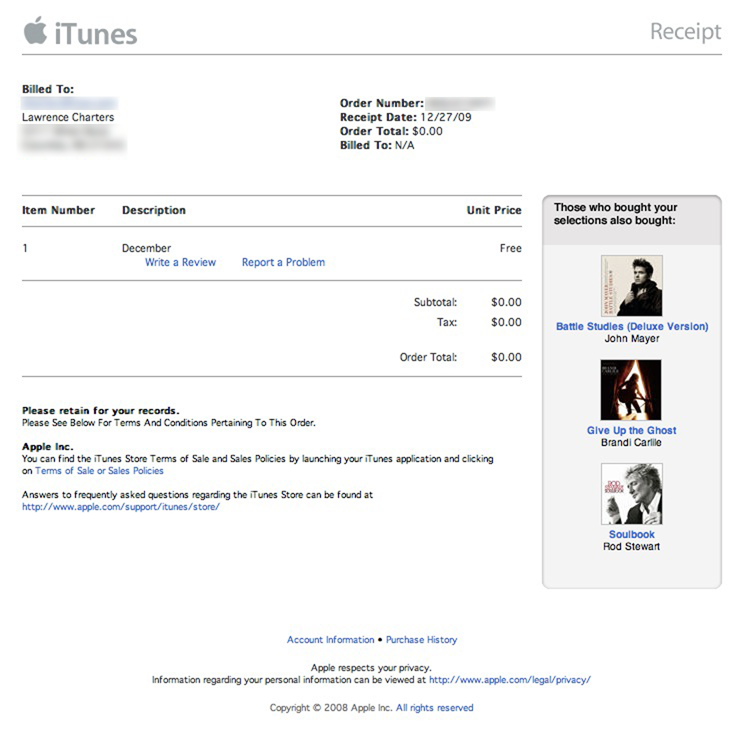 In December 2009, I purchased December on Apple’s iTunes store, and I have the electronic receipt to prove it. Because of my sterling character and general worthiness, it also didn’t cost me anything: Apple sold it to me for $0.00. There are some puzzling aspects to owning an entire month. For example, is the month exclusively for my use? Will everybody else be forced to make do with a year of just eleven months? And am I restricted to just December, and a 31-day year? Scope is also an issue. Did I buy every December, going back to the time when the Romans named it for what was then the tenth month of the year (decem meaning “ten”)? Do I own it for all time to come? Or did I buy just December 2009? The sales receipt is silent on these important questions. Now that I own December, I also have, if not buyer’s remorse, then buyer’s uncertainty. Was December the right month to buy? My favorite month is October, for reasons allergic as well as allegorical. December is known for harsh weather, but it always starts on the same day, every year, as September. Wouldn’t September have been a better choice? Especially if I could get it for the same price? Then there is the nagging fear of exclusivity. Civilization is based on the shared experience. Great novels are great not only because of quality and enduring elements, but because millions of people have read them. The Super Bowl is “super” because of the quality of play (though this year was extraordinary), but because that single event was shared by tens of thousands of people in person, and tens of millions through television and radio. What good is December if I can’t share it? And then I wondered: did Apple sell December just to me? If not, then, alas, I may not have a month of my very own. Perhaps I’m not as special as I’d like to believe. What I really want to buy from the iTunes store is not a month, but time in general. I’d like to buy a few centuries. Past centuries are often interesting – the 17th century was astounding – but future centuries hold more interest. I’d like to see if we solve interstellar travel, and preserve a pleasant environment on Earth, and spend more, globally, on health care and recreation than on warfare and policing. I’d like to spend a few centuries reading books I haven’t read, talking to people I haven’t met, and listening to music I haven’t heard. If the iTunes store starts offering centuries, I’ll start with one. I’m not sure how many iTunes Gift Cards it will take, but Costco sells them in bulk. I wonder if you can buy a century on an iPad?